Sliced almonds make quick work of adding crunch, protein and flavor to baked goods, salads and meats. While you can purchase a bag of sliced almonds at the grocery store, it may be more economical to purchase whole almonds and slice them yourself, as needed. The small size and rough skin can make slicing difficult, so you'll need to remove the skin and soften the meat of the almond in order to ready them for slicing. Blanch the almonds in order to remove the skin. Blanching is a method which uses first hot, then cold water to soften the skin of the almond, while stopping the heating process quickly to avoid cooking the almonds. Place the almonds in a colander over the sink and douse with a kettleful of boiling water. Then, quickly rinse with ice-cold water. Rub the skin off of the almonds using your fingers in a back and forth motion. 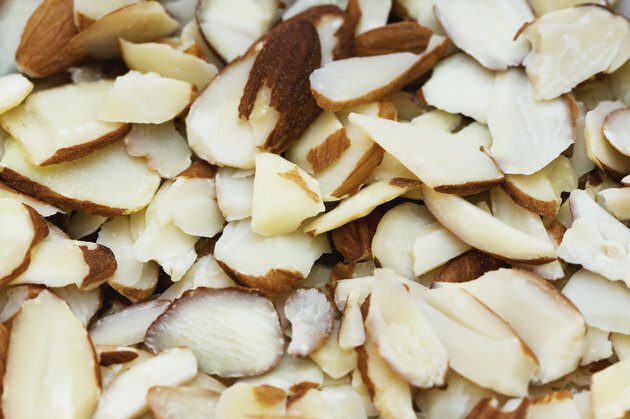 While removing the skin is an optional step, it helps soften the almonds for easier slicing, as well as allows for a more pleasant texture when using the almonds in recipes. Warm the almonds before slicing. Allow them to dry completely, then place in the microwave for 30 seconds until warm, but not hot. Transfer the almonds to a cutting board. With a sharp knife, slice the almonds vertically. As you slice, tuck your fingertips under your knuckles to avoid accidentally slicing your fingers on such a small surface. Store sliced almonds in an airtight container in a cool, dry place or place in a plastic bag and store in the freezer.